Dessert can be a dangerous game. 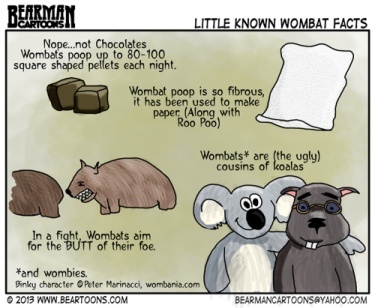 Editorial & pop (or maybe that’s poop) cartoonist Bearman took a stab at wombats and did this cartoon to prove how much he really loves us. His original Wombat Cartoon can be seen on his Beraman Cartoons website. Yay! I like fudgey muffins! Then you certainly deserved first spot! All you can eat chocolate! It’s one of my better ideas! Can you be my mommy, Soma? Yay! That would be really cool! I’ll be right over! I don’t think Soma will mind! Can I be his aunt? I think that would help a lot! Completely fab solution. The cold will numb the pain, too. Yep, and make my tummy feel better too! Quick, put some chocolate sauce on that!!!! Why can I see Fraz with his head hinged all the way back? I really like chocolate syrup! I want some chocolate syrup on my chocolate syrup! I always like cake with my syrup! You know it works just as well as dip. I’ve never tried chocolate syrup dip on chips. I’ve gotta try that! No, I know that’s BAD! Did you do that? Bad Loon! I thought they were too! But it still hurt me! Maybe I could have a marshmallow band aid? That should be sticky enough to stay in place… at least until it melts. On second thought, have you ever been able to hold a marshmallow in your mouth long enough for it to melt? That’s cause were twins, remember? OK, but you have to have one too! Fraz beat me to pointing out your genetic similarity. I bet if we dressed the same, no one could tell Andro and me apart! He just needs to skip a shave to have your spots. Or I could paint some spots on him. I’m sure Andro wouldn’t mind! Yeah, cake knifes are dangerous! I did! But it’s better now. That woulda been a smarter idea! Better to use a spoon Fraz. Just make sure it’s a blunt spoon though. Last time I saw one of those signs it made me really tired & worn out. I think it’s compulsory to obey them. Have you ever tried walking along a road for 20 kms with short stumpy wombat legs? Sign? Sign? Did you see a sign? I don’t see a sign. Maybe it’s your poor wombat eyesight. Or maybe your stumpy legs. I don’t know. The sign was a mistake since it had already been featured. It was supposed to be Bearman’s cartoon, which is now showing. Sorry about that! Those are the worst cuts of all! Yeah, I don’t think cake should bite back! Is it as bad as a paper cut from an envelope? It’s worse because it’s on my tongue. It’s better because it was from cake. Apparently, you are too young to know we used to have to lick envelopes to close them. Is an envelope like a cantaloupe? An envelope is a vegetable and a cantaloupe is a fruit? You’re probably right! I’ll try to be more careful next time. Tongue wounds are the worst! I remember trying to find some First-Aid when I got a paper cut on my tongue once. Did you find any? I didn’t. I had to suffer! Fraz is now stuck to the mailbox outside! Hahaha… oh no! I’ll go find some warm water! Hurry! It’s getting dark out! Luckily we got Fraz unstuck from the mailbox before dark. I don’t think he would have liked being out there all night by himself. Ouch. I do this all the time and one of these days I’m going to need that bandage. Cake knives should be plastic! I have a huge nylon one just for such a purpose. I’ll tell Chris to get one! They come in loads of sizes and shapes. I am sure he can find an appropriate one in the name of safety. Chris said he was gonna try to find a rubber cake knife. Now. my first thought was why such a sharp knife to cut a cake…? When I accepted maybe it had hard parts to it, I suddenly realized why even cut the cake…? I’m all for “community cake” where everybody gets their own fork (or spoon, perhaps) and dig in!! At any rate, Fraz – paper cuts, knife cuts or frozen mailboxes – all bad ideas for First Aid!! Don’t let your eyes get your tongue in trouble!! If we did the community cake thing here, me and Winky would be the only ones who get any cake. And then everyone else would be mad at us. It’s pretty hard not to lick a good cake knife! But it was a knife with yummy cake icing on it! I don’t think I’d want to pierce my tongue. Cutting it hurt enough! Since I have a steel tongue I never fear knives, but if I even look at a hand mixer my tastebuds run for cover! W.C.C. And they come in all shapes and sizes! They should come in shapes for tongues! That’s just the ones I need! My tongue feels better now! I hope you learned not to do that again unless it’s spatula. I kinda sorta learned. But cake knives are hard to resist! Tell me the story of that. I meant when I cut my tongue on the cake knife, I almost cut it in two! Chocolate and chocolate milkshake…How awesome is that?! It’s nice to have good friends! And it’s nice to still have my tongue, too! Well we’re your friends, no doubt about that. But without that little tongue you wouldn’t be able to taste your food. Ahh!! I guess I better take care of it then! I kinda think I might wanna lick a knife now. . . I guess I walked right into that one. Okay, a deal is a deal. So I brought you a 6 layer devil’s food cake with a half a can of chocolate frosting on each layer. Seven scoops of ice cream…I better make that 14 I know that Gray would love to share with you. And I thick, rich, super sized, top of the line Frazo Wazo Fudge shake with topped with chocolate whipped cream, with a drizzle of chocolate syrup and a chocolate cover cherry in the center…..One tiny napkin and a really cool crazy straw! Yay! I’ll be happy tonight! You’re the best aunt Deb! I promise! I’ve got enough cake and milkshake to keep me busy all night! Well at least until I fall asleep. Okay, then I’ll give you this extra dozen of chocolate peanut butter cookies to put on your night stand in case you wake up a little hungry. I give all my wombies the same thing every night. Your Wombies are really lucky! I guess I’m lucky now too! I’ll have cookie dreams tonight! My tummy will never starve with you around! That was all really yummy! The chocolate eclairs were the best! You sure won’t, Fraz! Today we’re going to have subs for lunch….chocolate subs. With whipped cream and fudge I hope! Of course! 🙂 Now would you like chips or fries with that? Yes! I brought you an extra large bag of chips and a great big plate of French fries. And to wash is down I stopped at Dairy Queen and picked you up 6 different Blizzards! Thanks Deb! That should keep me busy at least until school gets out. Good! For supper I think we’ll all head over to your Pizzeria, then to Winky’s chocolate factory! Sound good? I’m already at my pizza place! I’m waiting for you! Here I am, Frazzie! And I brought Blizzards for everyone! My own milkshake shack?? That’d be awesome! Yes, I’ll have to get that one started and done before the prime season actually begin down here on the island…You could make a lot of money to get things with. And I could make a lot of tummies happy with your super thick milkshakes! I’d be your first customer! Yay!! I hope all the tourists will come too! Oh of course they will, Fraz. My landlord for the camper has a small gift shop and sell over 31 flavors of fugde, and he’s a millionaire from it! Oh boy, I’m gonna be a milkshake millionaire! I’ll make sure to have some fudge milkshake flavors! We need all kinds just like there fudge shop. Not just fudge flavors but other kinds too. Llike watermelon, bannan, strawberry….all kinds of fruit flavors…then introduce a new flavor each month…and offer coupon after they buy a certain amount of shakes too! Fraz….Your going to be rich!!! Those are really good ideas! I think you should be my store manager! We could be rich together! And we’d get to taste test all the new flavors! Sound like a lot of fun while we make lots of money. I think you need two! One that is stationary and the other one on wheels to go back and forth through the islands village…there is only one main road and everyone has to use it. And it will be easy enough for any of the Wombie to drive too. It will be small enough to use the path along the road side! That sounds super! Maybe I can get Binky to add rocket power too! It’ll be the fastest milkshake wagon in the world! With the bestest milkshakes! We’re gonna be rich this summer! That would be great for going around the world, but here on the island the speed limit is 35 mph…there’s children out of school then and it’s the only main road…I know you understand. Hey Fraz, I need to know how much your want to charge for your milkshakes? Will there be just one size? If not how much for each size? OK, I guess so. Maybe Binky can make me a rocket powered boat instead. I think there should be small, medium, and Wombie sized milkshakes. They’d be be 10 cents, 25 cents, and 50 cents. Then everybody should be able to afford them. Is the Wombie size one 50 cents or 10 cents? I’m guessing is the one for 50 cents? Yeah, the Wombie sized one is 50 cents because it’s like three times the size of the medium! Okay, I got it! Your gonna be rich, rich, rich! And the best part…Your gonna have fun doing it! That’s the only way to do it! That’s awesome! The best milkshake shack ever! We’re gonna be rich AND full! Your welcome, Fraz! And I’m stuffed from tasting all the different flavors! Yeah, we might need a little nap after all that taste-testing! No time to break! Everyone has been ordering shakes and I need you there to fill their orders. Two or three need them mailed. Hurry! I can help pull this with the truck and take order too! Help Me, Fraz, Help Me! OK, OK! I’m back! This milkshake business is going to be a lot of work! But fun work! We need to hire some Wombies! They can work for free milkshakes! I’m in, Fraz! I love milkshakes! I’m in too, Fraz! I love milkshakes too! That’s great, guys! We’ll be able to keep the milkshakes going 24 hours a day! Fraz’s all night milk shake shack! You wouldn’t want to work that hard, Fraz. You got to have most of your time to have fun! Yeah, I guess you’re right. Maybe Binky could make a milkshake serving robot! That’s a great idea, Fraz. See if you can get Binky on that soon! Binky never likes my ideas. He’s always too busy trying to get his rockets to work. Maybe I’ll try and build a milkshake serving robot myself. OK! We should be able to get the robot made in a couple of days I hope! Fraz, Mitch is has gone through some boxes of wire and electronics that he was going to get rid of, so I brought them to you. Just toss what you can’t use. I bet we can use all of it! We need parts! And probably a brain! I have two old computers. I’ll send you the motherboards, nah, just all of it. I hope they’re smart computers! Well….You can always part out what left in them that’s still good. He’ll be a two computer brain robot! That’s a good idea! I wish I had a backup brain! Me too, then this tired one could take a nap. And I could send my backup brain to school! Fraz, cheer up. Maybe you can eat ice cream. That could help. An ice cream bandage sounds pretty good! A forked tongue should be good for eating cake! I think my tongue is knifed. Maybe I can move to Germany then! Knife licking is fun…but dangerous. And yummy, too! At least when it’s a cake knife! Yeah, poor me. I deserve some ice cream! Lick the the cake mix bowl not the knives! Oh nooo, Fraz. be careful next time. I’ll try to! But cake knives need to be licked!